I am very guilty of getting a stamp set and then never using it. Like I just had to have it and then it sits in the drawer; lonely. 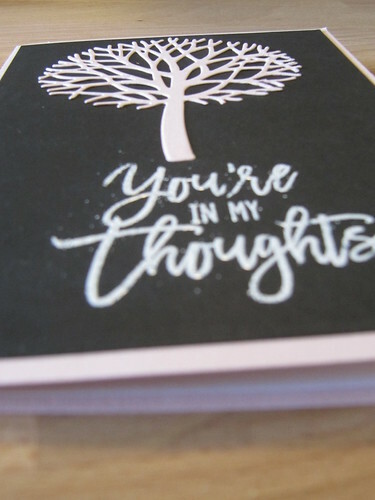 The beautiful branches set from Stampin Up is one of those sets. I fell in love with it and then it just sat in the drawer. I challenged myself to make 10 different designs with it before I put it away again. The cards below are the 10 designs I came up with. The first card I have to share with you is back to school themed. 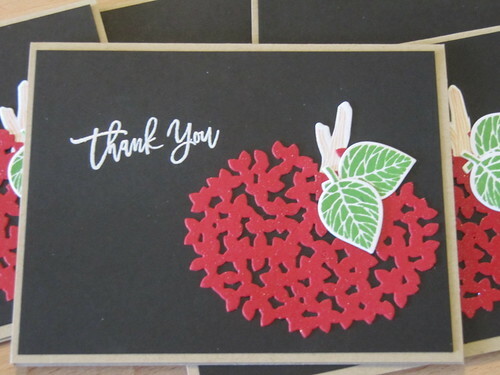 I used the big puffy flower piece as an apple and made the background black like a chalkboard. I added some wink a stella clear to the apple. You can see it a little in this picture. I'm sure I will be using these this year. 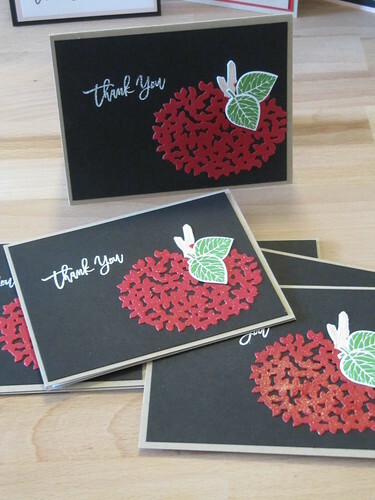 I always send thank yous when students bring me little Christmas, Valentine, and end of year gifts. I wanted to add to my birthday card stash. I love how versatile this set is. 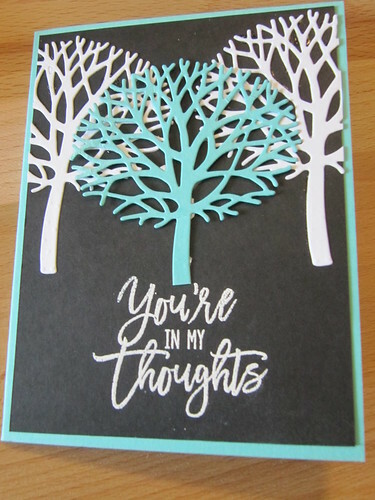 This one die cut makes a flower and is leaves to a tree. 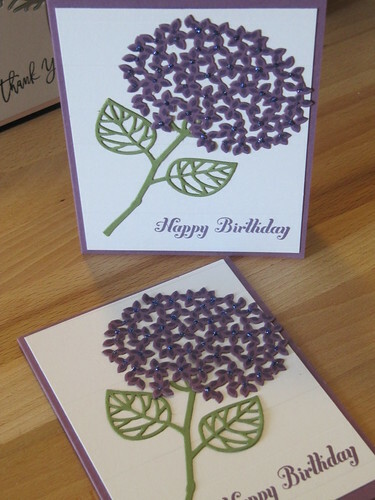 For this card I used it as a hydrangea. 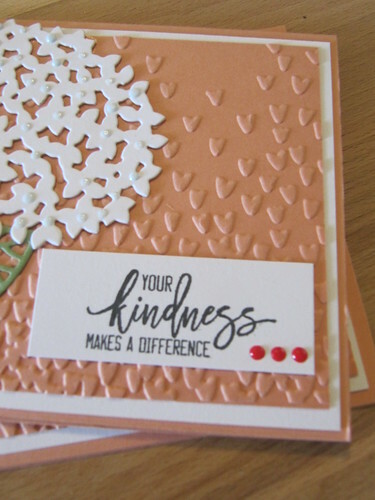 I stamped the image ontop of the die cut piece. My misti made it fery east to accomplish this. 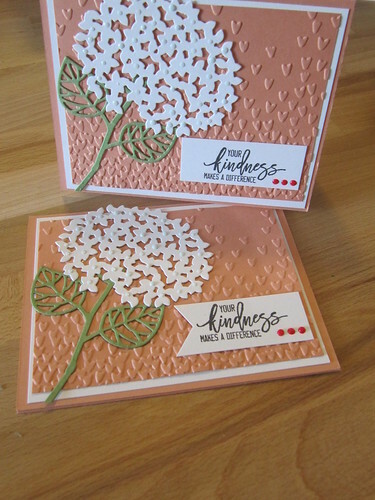 I finished these two cards off with a fun sentiment inside from Bring On the Cake by Stampin Up (another neglected set I hope to make some cards with soon!). I feel like I can never have too many thank you cards. I am always reaching for one. 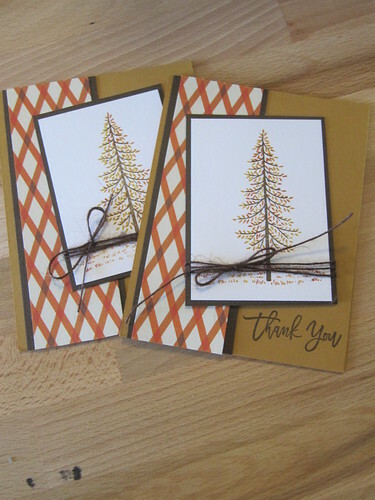 I like to have them in many different styles to fit the thank you occassion. 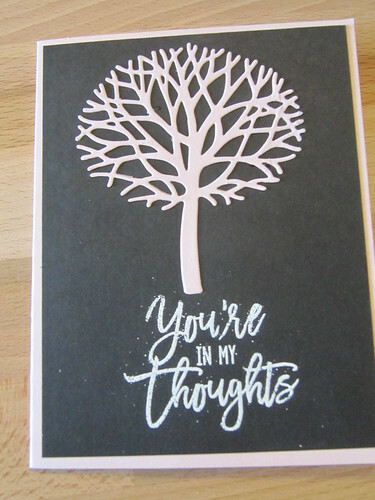 For this card I cut the tree branches out of silver paper and layered it into the card. 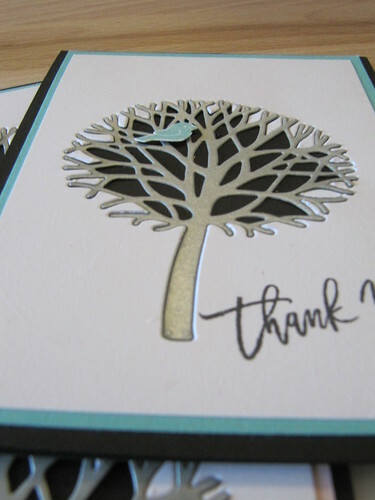 The tree is recessed into the card with the matching bird sitting in its branches. 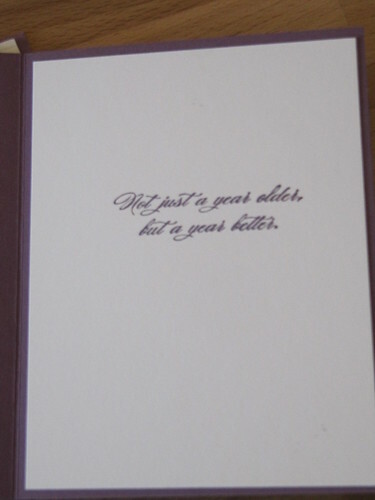 For card number 4 I pulled out even more unused things with this embossing folder. 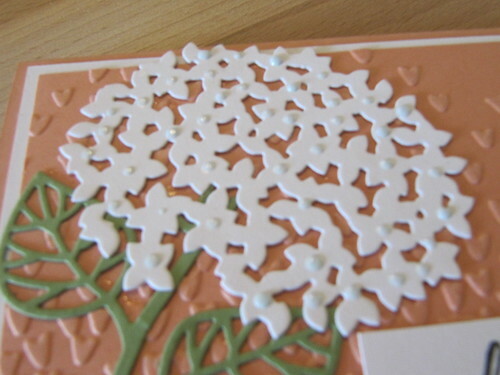 I didn't stamp the flower, I used only the die cut and a sentiment from the stamp set. I wanted a little more dimension on the flower so I added some nuvo drops for the flower centers. 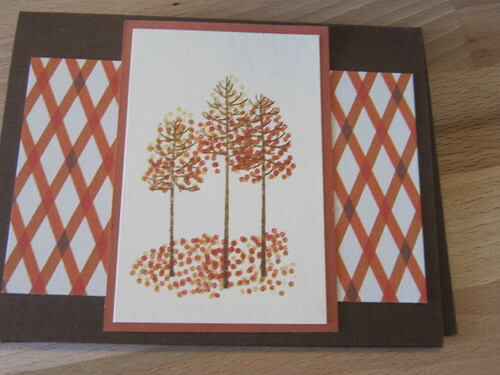 I set my sights on fall colors for the next few cards. 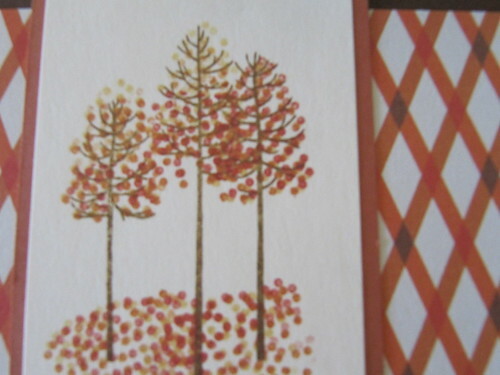 I love fall colors and I feel August is close enough to fall to pull them out. 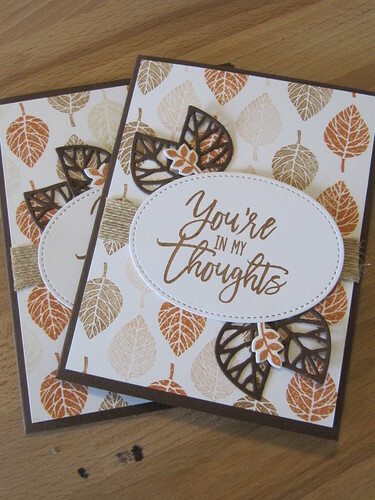 To create this card I stamped the leaves in 3 colors of distress ink in a pattern across the card front. 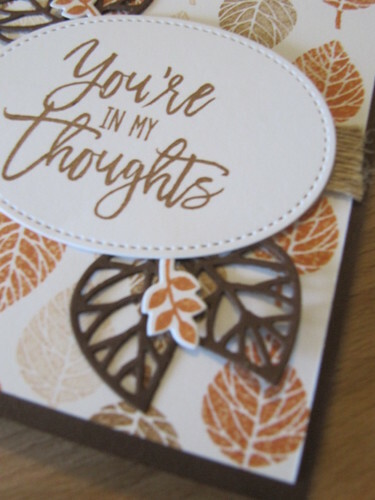 I also used some of the leaf die cuts and my stitched ovals. This set also works for Christmas. 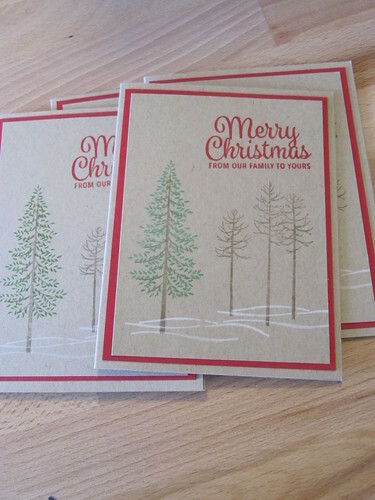 I went with some bare and evergreen trees for this card. 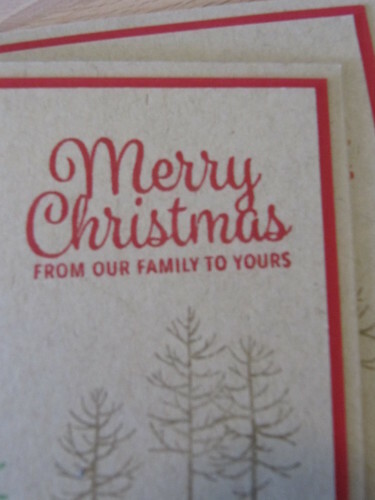 It is a very simple card but I love the combo of Kraft and red. 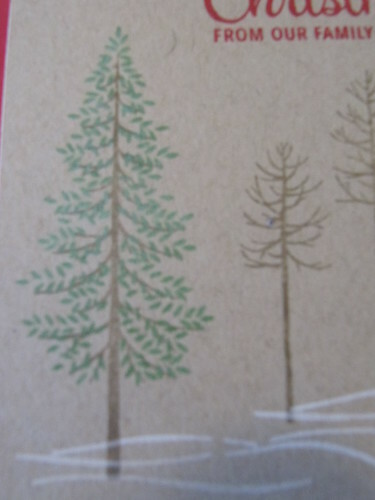 I layered some patterned paper and used the evergreen tree again. This time I stamped it with some fall colors. 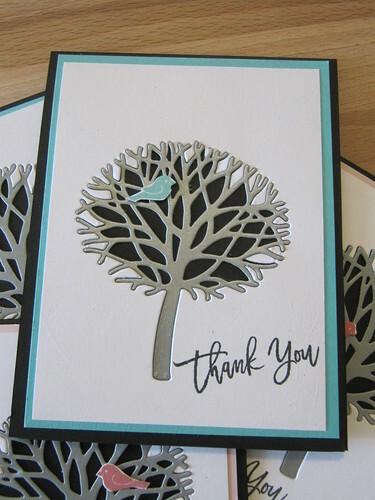 I just kept inking parts of the leaves up in different colors and stamping it over the branches. 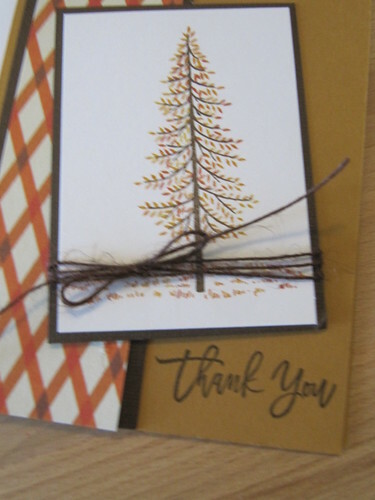 I finished the card off with some brown twine. 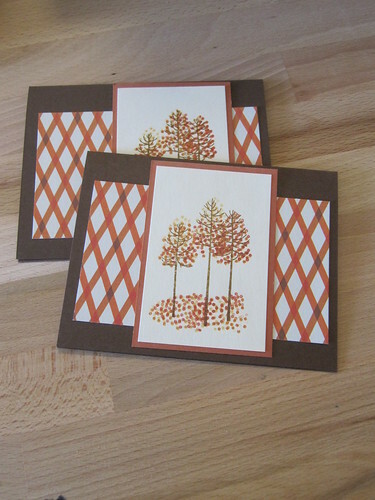 I used up the scraps from that same piece of patterned paper I used on the previous card again. This time I used the smaller tree and leaves. 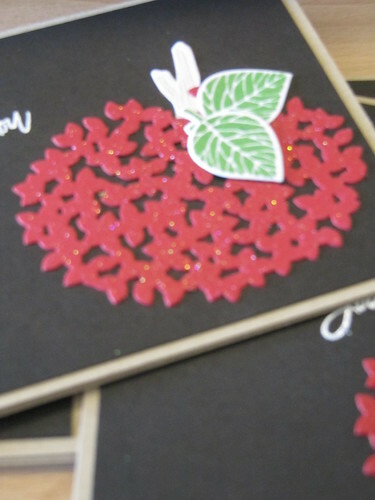 I stamped part of the leaves on the ground for fallen autumn leaves. 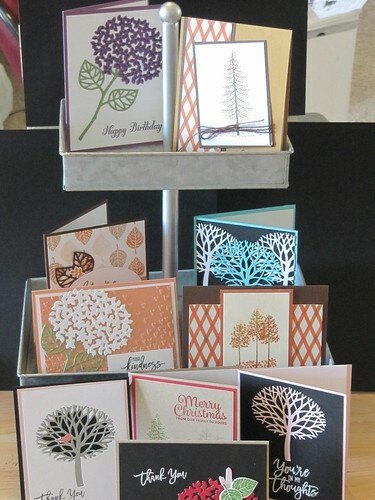 After I had cut those recessed tree card out I had several trees in white, pink, and aqua. I used them on the last few cards. I made it through all 10 designs. I want to try this again with another stamp set that hasn't gotten any love.